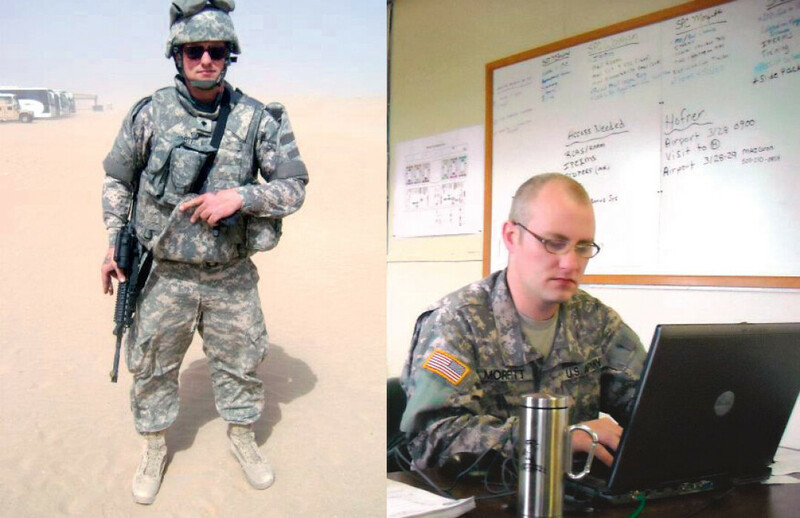 Scott Morfitt served in Iraq with the Minnesota Army National Guard’s 34th Infantry Division. I am here today because I am a veteran. That is not a metaphorical statement; Eau Claire has become my home because of my involvement with the military. Originally, I came to Eau Claire to go to school on the GI Bill and recently my fiancée and I bought our first home together with a Department of Veterans Affairs loan. So I’m literally here at this moment because of my time in the desert near the Cradle of Civilization. After I reassure them of my veteran status, people are genuinely interested in learning more about the experience. That’s great, because one of the things many veterans want is someone to listen to what they have to say. Many times these discussions lead to comparing and contrasting our experiences with those of veterans of previous wars. One of the biggest differences I see right away is that we had Facebook. That is not to say that every service member deployed during these last two wars has had access to the Internet and social media, but many have. Which means that they’ve been connected to their lives back home for better or worse. It’s toughest to be gone when “worse” is happening in front of your eyes, yet it’s a world away. That also means that these were among the first wars during which we were aware of the critique of the war in real time. I was deployed late enough in the Iraq War that I actually watched documentaries such as Iraq for Sale with people I deployed with. It was kind of surreal and comforting at the same time. One thing I’ve appreciated since we’ve gone through these last two historically baffling occupations is that even the staunchest opponents of war have been nothing but respectful to veterans. That says something good about us as a whole. The other difference I see right away is that my generation doesn’t wear nearly enough caps showing our service. Since I was a little boy, I always admired the caps veterans wore. I started to know the differences between the branches of service as well as many other things that I used to identify exactly how they served and when. Some see these hats as bragging, but I never have. I see them as a reminder that as a society we live among women and men who have sacrificed for their country. With my generation not being as into these caps as those before us were, I guess we might just have to be mindful with what we say and with how we treat our fellow humans. That’s probably not bad overall. The last thing I tell people about being a veteran is how awesome it is to be a veteran here in Eau Claire, both at as a student and as a community member. While you hear stories on the national news of other vets having to jump through multiple hoops to get their benefits applied to their education, I never had that problem here. The Veterans and Military Education Benefits office at UW-Eau Claire gave me the tools I needed to focus on my schoolwork confident that the government was holding up its part of the bargain. If you are a vet even considering going to college, I strongly suggest that you talk to them. They can help make your transition to school very smooth. I don’t want to leave Chippewa Valley Technical College out of this, either. Even though I never had the veteran experience there, the things I read about their programs for veterans entering the workforce are amazing. The Eau Claire County Veterans Office is also a “squared away dress-right-dress” place for accessing VA benefits, job searching, and understanding what other resources are available. If you need help as a veteran, they can put you in touch with what you need, which is important. So, I do want to say thank you to Eau Claire for being a great place to be a veteran. And if you know a special veteran in your life, please see if they want to chat about their experience or perspectives. For many of us, it’s the best way to go back from soldier to citizen.